Bao Khanh hotel is proud to get the certification as a 3 star hotel at 2008 by the Vietnam National Administration of Tourism. Our hotel now supports a nearly double room number of 55 after upgrading and enlarging the infrastructure. All our rooms are upgraded and well-furnished rooms with a modern standard of amenities. Staffs of Restaurants and kitchens are well trained with high and professional skills. Training classes for staffs with principle “maximizing the guest satisfaction” will make you feel coming to Bao Khanh hotel like at home. Our hotel also extends more services like tourist information centre and beauty salon to give the best value to the guests. Located beside Hoan Kiem lake, Bao Khanh hotel is a perfect place for both Vietnamese and international business and leisure travelers coming to Hanoi. You will experience moments of freshness and romance strolling around Hoan Kiem Lake. Our hotel is very convenient for guests to walk in the shopping areas with full range of souvenir goods such as silk or handicraft. Bao Khanh is a newly-furnished hotel with modern and beautiful architectural style. The diverse range of international standard facilities like elevators, conference rooms, bars and restaurants will serve the most perfect services. Standard room is cozy room with 1 big double bed with Small window, bath-tub, mini bar, IDD Telephone, cable TV, Internet access in room, WIFI... Rates are for 2 people. The room caters for a maximum of 2 adults, and a maximum of 1 child. Suppeior room is nice room with 1 Queen size bed or 2 single bed with window. Cozy room, nice amenities, full equipment, bath-tub, mini bar, IDD Telephone, cable TV, Internet access in room, WIFI, working desk... Rates are for 2 people. The room caters for a maximum of 2 adults, and a maximum of 1 child. Deluxe room is nice room with King size bed with window or bacony, nice city view or lake view. Cozy room, nice amenities, full equipment, bath-tub, mini bar, IDD Telephone, cable TV, Internet access in room, WIFI, working desk... The room caters for a maximum of 2 adults, and a maximum of 1 child. 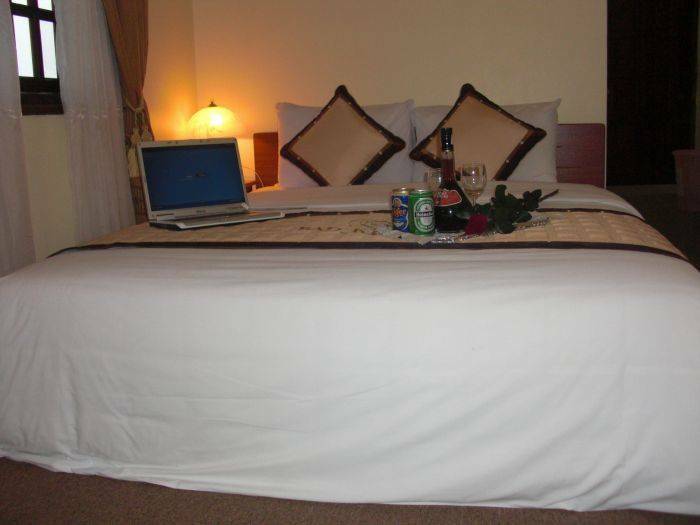 Luxury room is nice room with King size bed and twin bed with window, nice city view or lake view. Cozy room, nice amenities, full equipment, bath-tub, mini bar, IDD Telephone, cable TV, Internet access in room, WIFI, working desk... The room caters for a maximum of 4 adults, and a maximum of 1 child. 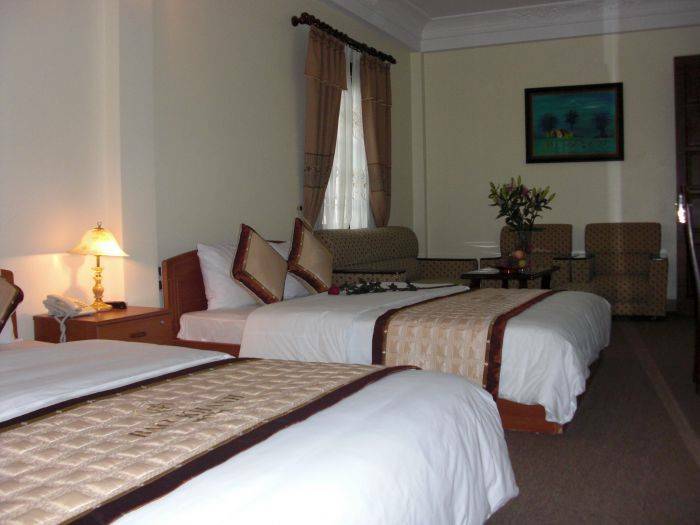 Bao Khanh Hotel Hanoi is an excellent mid- range hotel with top- quality services. It is centrally located in the centre of Hanoi Old Quarter, tourist Areas. It is the first choice to stay, to celebrate, to meet, dine, enjoy, relax and do business. Safe, clean, and fun, the Bao Khanh Hotel Hanoi is surrounded by neon lights, chapels, and the fabulous wonders of nature! So prepare your list of sins to commit and start- down the road to excitement and fulfillment. A famous reatuarant is the world's most popular chicken restaurant chain, specializing in Original Recipe®, Extra Crispy™, Twister® and Colonel's Crispy Strips® chicken with homestyle sides. No show will incur first night charge. From Hanoi Railway Station or the Bus Station, take CP Taxi or Hanoi Tourist Taxi . Rate: approximately VND35, 000 (roughly USD2. 2). Don't take the other taxis to avoid any scams. Journey time 10 minutes. Nearest airport: Distance is 35km from Noi Bai international airport to Bao Khanh hotel.